Today marks the 50th anniversary of the death of Fritz Kreisler, one of classical music’s early megastars. Like any violinist starting out, Fritz Kreisler simply needed a few attractive pieces to complete his recital programs. He loved to arrange the music of others, and was lucky enough to stumble upon a trove of unknown manuscripts, gems by older Baroque composers moldering away in a monastery in Europe. He convinced the monks to sell him the entire collection. The pieces were by then-little known composers like Pugnani, Louis Couperin, and an Italian fellow named Vivaldi, but it mattered little. In the first three decades of the 20th century, legions of fans came to adore Kreisler’s arrangements, which were no doubt faithful to their originals yet also spoke with an unmistakable musical accent, that prewar Viennese lilt that was his alone. There was just this one problem with Kreisler’s back story. None of it was true. Today marks the 50th anniversary of the death of this inimitable Viennese fiddler. And at a time when it so often seems that the joke is on the violinists - Joshua Bell busking in a subway while almost no one stops to listen, or, as a recent study showed, professional players allegedly unable to hear the difference between a Stradivarius and a modern instrument - it seems a good occasion to recall a moment when the tables were turned in the greatest hoax ever perpetrated with four strings. Kreisler’s ruse, sustained over some three decades, deceived thousands if not millions of listeners - critics, scholars, and fans. The violinist did, in fact, create many legitimate arrangements, but he also composed outright a full 17 of the works he attributed to those Baroque composers. There were no originals. The hoax today is barely remembered, but many of these delightful pieces still turn up frequently, credited now to Kreisler himself. For newcomers, “A Tribute to Fritz Kreisler,’’ just released by Deutsche Grammophon, is a welcome two-disc sampler of other violinists performing Kreisler’s music alongside a few of Kreisler’s own historic recordings. Or, if you prefer a live performance, New England Conservatory students of the violinist Miriam Fried will serve up some of this repertoire in a free concert on Thursday, which happens to be the birthday of both Kreisler (b. 1875) and Jascha Heifetz (b. 1901). Among classical music’s early megastars, Kreisler’s image has aged far better than most, partly because it was always about an earlier era. His biographer Amy Biancolli recounts a moment in 1921 when the violinist’s passionate advocacy for his war-ravaged home country created a rumor that he had actually been appointed as the Austrian ambassador to the United States. The subsequent official denials only proved the point. For most of his long career, Kreisler - an impeccably coiffed gentleman with a courtly stage manner - was the ambassador par excellence to a glittering fairy-tale Vienna. It was an image both sincere and brilliantly constructed. He used to tell stories of his Bohemian days playing music in cafes where Johannes Brahms might stop by to sprinkle the stands with his own freshly inked chamber works. Kreisler would claim, with all due modesty of course, that he deserved no more credit for his musicality than a fish does for its ability to swim. He was, simply, a child of Vienna. 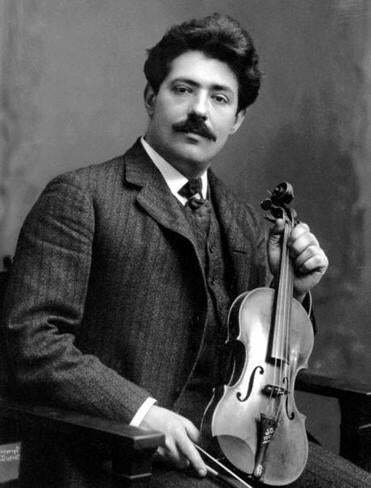 When World War I broke out, Kreisler served for a few months in the Austrian army, then returned to the concert stage with a limp of vague provenance. He also published a war memoir, “Four Weeks in the Trenches.’’ In the book’s most endearingly improbable anecdote - which if true would surely be classical music’s crowning contribution to the theater of war - Kreisler recounts how he used his well-trained ear to identify the positions of Russian artillery based on the distinctive sounds emitted by the shells ascending and descending en route to their targets. As Biancolli shows, the American public devoured these stories of a cultivated violinist on the battlefields of Europe. That is, until the United States entered the war on the opposite side, and Kreisler was nearly swept away by the same wave of anti-German sentiment that landed Boston Symphony Orchestra music director Karl Muck in an internment camp in Georgia. The political attacks threw a wrench in Kreisler’s touring schedule, but he used his downtime to co-write an operetta called “Apple Blossoms,’’ which later had a respectable New York run. Fred and Adele Astaire were in its cast. Kreisler eventually became an American citizen, performed well into the 1940s, and died in 1962. In a peculiarly American coda, this quintessential child of Vienna was laid to rest in a Bronx cemetery, a short walk from the grave of Herman Melville. These days the charms of Kreisler’s playing still reveal themselves with even a casual listen. In the new compilation, one hears for instance his remarkably deft rubato in the “Liebesfreud,’’ or the way his vocal-like portamento confers that note of dignified sadness on the “Liebeslied.’’ But more than any other aspect of his playing, it was Kreisler’s approach to vibrato that became revolutionary. Before him most players had reserved this left-hand effect for special occasions, as a kind of ornamentation, but Kreisler transformed vibrato into an almost-continuous sonic sheen, a layer of personal warmth that could enhance even rapid passages or those of minor musical interest. How did such a sonic innovator evolve into the personification of an older 19th-century sensibility? Flesch here too has a poetic theory, claiming that the times caught up with - and then surpassed - Kreisler. “The more agitated the world scene became,’’ Flesch wrote, “the calmer and more serene Kreisler’s artistic utterance appeared to become.’’ One might add that his playing also stands out for the way he used both his sound and his compositions, including his signature cadenzas, to impart an artistic personality in the fullest sense of the word. As for the great hoax, perhaps people forgave Kreisler so quickly because the ruse was ultimately tied to such a core facet of that artistry: a gift for using music to both evoke and invent a past, for blending memory and fantasy in the sound of a violin.